As an eighth-grade student in the Philly suburbs, Courtney Friel had the opportunity to shadow a local reporter. By the end of the session, she had found her calling. Today, Friel, who spent much of her formative years romping in the sand and surf of the Jersey Shore, is fulfilling her journalism dreams as an entertainment and technology correspondent for the FOX News Channel, where she’s worked since 2007. But Friel isn’t just fluff:she’s been known to go head to head with Bill O’Reilly, host of The O’Reilly Factor, and also fills in on the highly rated morning show Fox & Friends. She and her husband, CNN reporter Carter Evans, welcomed their first child—a son, Cash—in January. South Jersey Magazine caught up with Friel to talk about growing up in the area, her life in front of the camera and the hazards of live television. 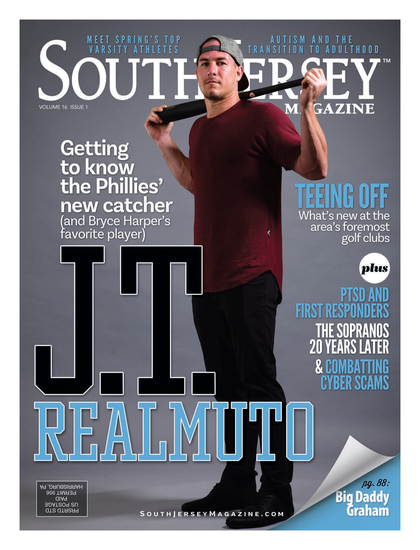 SOUTH JERSEY MAGAZINE: A lot of people want to be on TV, but you actually realized the dream. What’s your secret to making it happen? COURTNEY FRIEL: It does seem like a lot of people want to be on TV to see their face, and think you just read a teleprompter. In reality, it’s a lot of work and a cutthroat business, so you’ve got to love what you do and always aim for improvement. I’m lucky: I had a passion for the news biz at a young age and was willing and able to learn all sorts of jobs in TV production…. My first local news gig was in a very small TV market—Jackson, Tenn.—and I was the camerawoman, editor, writer, news van driver, reporter, main anchor and teleprompter roller … all for about $7 an hour! SJM: On your first day on live TV in Jackson, you came face to face with a tornado that pretty much destroyed your car. Compared to that, everything else must seem easy. CF: That was a first day on the job I’ll never forget, but I wouldn’t call reporting at forest fires in 118-degree weather “easy” either. Now that I cover entertainment, it’s mentally an easier topic than murders, but you still have the deadlines. Obviously having a cameraman on every shoot is way easier than doing it yourself; I sprained my back twice carrying all that equipment in Tennessee. SJM: What do you remember most about growing up in the Delaware Valley? CF: My fondest memories are watching the Fourth of July fireworks at Penn’s Landing with the family, Dave Matthews concerts at the E-Center [now Susquehanna Bank Center in Camden] and, of course, going down the Shore. SJM: You’ve faced off on air with Bill O’Reilly. How would you describe Bill as a sparring partner? CF: I’m usually very nervous when I enter the “No Spin Zone.” There have been several times before starting my segments with Bill that I literally thought my heart was going to beat out of my chest! But it’s a great opportunity to be on The O’Reilly Factor. I like watching the show, just not my performances on it. SJM: You must have many long days. How would you describe a typical day for you? CF: Every day is different, which is what makes the job so fun. I get to travel to Los Angeles or Nashville for awards shows, and cover other fun events like the Kentucky Derby or music festivals. When I do reports on Fox & Friends, I have to be up really early. Anything I cover from the West Coast usually requires all nighters; I recently did four days of American Idol coverage for the FOX affiliate stations, and my shift was midnight to noon. In New York City, I cover red carpets and movie junkets, and do a lot of celebrity interviews. In between events, I’m looking for ideas, working a story or shooting segments for FoxNews.com and the international channel. SJM: What are some of your most memorable on-air moments—whether good or bad, embarrassing or redeeming? CF: Good: The three times I’ve covered the ball drop in Times Square on New Year’s Eve—very exhilarating! Bad: While interviewing a group of kids at a glee club on live TV, one passed out and fell right off the riser in front of me; Jimmy Kimmel then had a little fun with that clip. Embarrassing: One time during a live report in Palm Springs, my mind completely went blank and I couldn’t remember my name, where I was, or the story details; I had to bend down and pick up my notes in the shot. Redeeming: I was doing a live interview with Hank Williams Jr. and he spit … off to the side that landed on my purse! I couldn’t believe he did that but I kept on going, until he got distracted and walked away mid-answer.